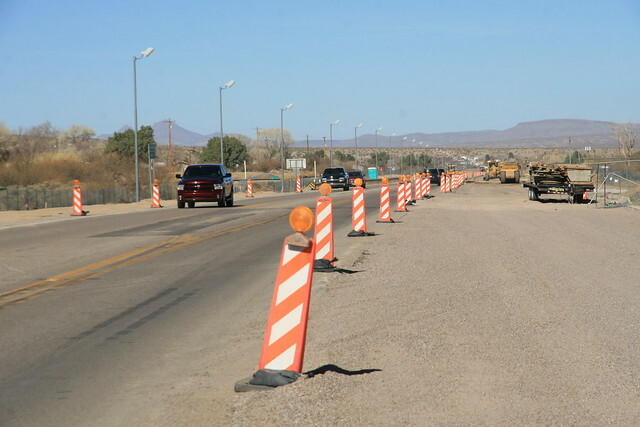 Last week we let you know about two projects improving US 70 on the San Carlos Apache Indian Reservation in east-central Arizona. This post highlights one of those projects and the improvements underway in a reservation community about halfway between Globe and Safford. In addition to repaving US 70 between mileposts 293 and 297, this $9 million project is making some big changes for the better in Bylas, including raised medians, pedestrian walkways, a pedestrian hybrid beacon and drainage work. The photos above, taken in February, show the many upgrades coming to this community. The work includes adding a pedestrian hybrid beacon, which helps pedestrians safely cross the road. That will be the first on the San Carlos Apache Indian Reservation. Information about how the beacon works is available at azdot.gov/phb.